“Life returns. Life prevails.” At least that’s what the Daleks have to say about the trailer for the eighth season of Doctor Who. The last time we saw the Doctor, he had survived the Seige of Trenzalore with a little help from the trapped Time Lords he had been fighting to protect from the Daleks, Cybermen, and Weeping Angels. Now with a new set of regenerations under his belt, everything looks back to normal for the doctor – or does it? As I discussed in my last article, it appears as though this new Doctor has no memory of Clara or even how to fly the Tardis – two incredibly important points. This means that the Doctors hasn’t only forgotten what has happened to him recently; but has forgotten one of the fundamental traits of the Doctor. So does that make him the 13th Doctor; or a new 1st Doctor? Considering Peter Capaldi will play the new Doctor, he will tie for the spot of oldest Doctor, an honor originally held by William Hartnell who played the First Doctor – both 55. In many ways – both Doctor and Actor – this seems to be an eerily similar path, so perhaps this is a new beginning for the Doctor. 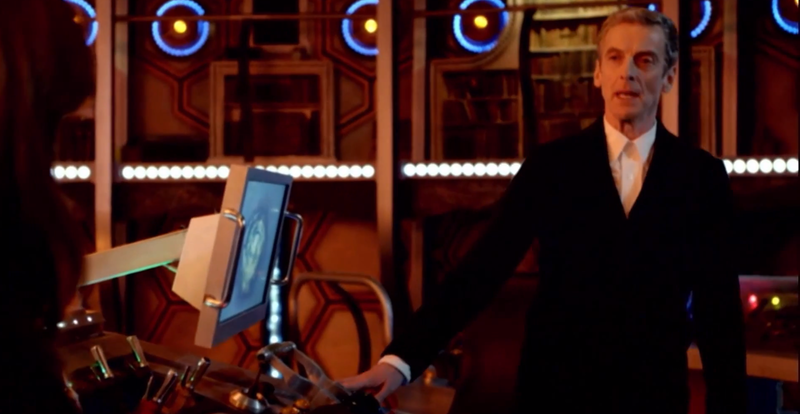 Whether a new beginning or not, we know Clara will help the Doctor remember who he is – or at least what he’s done – ; and this is where the trailer finally brings us in. During the trailer we hear that the Doctor eventually remembers his past deeds and has decided to finally do something about them. Wait a second, when has the Doctor not done something about them? Until now, the Doctor’s journey have all been to explore time and help people along the way. This is especially true about the Doctors from 9 onward who have tried to make up for their sins during the Great Time War. So when this new Doctor says he’s going to finally start doing something about his past deeds, what could he mean? The obvious answer is that he’s going to bring back the Time Lords. During the Day of the Doctor, we learned that the Doctor didn’t kill his entire race; but actually sent them to a sort of pocket dimension in space/time. We saw this Doctor present for that fateful action during the Time War, so it’d be interesting to see if Moffat actually addresses that cameo role or dusts it under the rug like most of his clashes with continuity. Though beyond this new mission – and chance to make up for his past actions – there’s something else about this new Doctor. He seems … darker. His voice seems less playful and not as full of wonder as past incarnations. This Doctor means business and not even Clara knows whether or not he’s a good man anymore. Then again, this could be because he isn’t a kid anymore. For many of us – that only know the 9th Doctor onwards – this is the first time seeing an elderly Doctor in action for a season. I’m sure he’ll show signs of his sense of wonder again – Clara will help with that too – but this could very well be a season of Doctor Who that many of us have never seen before. As always, I’m nervous with Moffat leading the show since he has trouble keeping continuity within his own storylines – let alone the storylines of those before him. Thankfully though, many old friends and enemies will be returning this season so I guess we’ll just have to turn a blind eye to continuity. As far as Capaldi as the Doctor, I’m eager to see what he can do. Doctor Who returns to BBC August 23rd.